Perennials are our mainstay and our foundation. We began as a perennial nursery, and these plants form the basis of our business. Flowering and foliage perennials provide an ever-changing palette of color and texture throughout the seasons. Woody plants (trees, shrubs and evergreens) are the most permanent part of the landscape and are often called the “bones” of the garden. 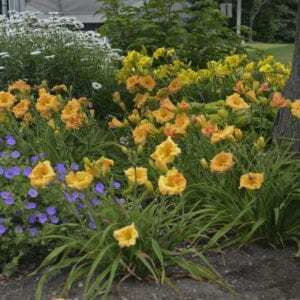 But perennials, with their endless variety, serve to “flesh out” the garden with exuberant growth and color. A well-designed perennial garden is never static. It changes every few weeks as each member in the cast of characters takes its turn in the spotlight. The challenge (and the joy) of perennial gardening is choosing plants that keep the show going, from spring to fall. Perennials go dormant during winter and return each year in the spring, growing and increasing in beauty as the years go on. We offer more than 600 varieties of perennials, all carefully chosen to provide our customers with the most attractive, interesting, hardy plants that are suited to our climate.